Vegetarians of Washington has submitted a population-health-initiative-proposal to the University of Washington Population Health Initiative, which aims to bring together the research and resources of the UW and partners around the Puget Sound and beyond to improve the health and well-being of people around the world. Funded by a gift from the Bill and Melinda Gates Foundation, the Initiative will focus on three key areas: human health, environmental resiliency, and social and economic equity. The potential for improving health and saving human lives by encouraging the world to shift to a plant-based diet is enormous. The costs of this project are small, in comparison to the potential huge global savings in healthcare costs, not to mention the potential for saving the planet from climate change and many other environmental crises, and freeing up vast quantities of land and water for an ever-increasing population. They will be considering all proposals in January 2017. We hope they step up to the plate! The following is an excerpt from our book, Say No to Meat, by Amanda Strombom and Stewart Rose, published by Healthy Living Publications. This book includes answers to all the questions you may have about becoming a vegetarian, and is invaluable to new and existing vegetarians alike! How can following a vegetarian diet help the hungry people of the world? Let’s start with the agricultural facts of life. Farm animals function, in effect, as food factories in reverse; that is they give us less nutrition than they are fed. For instance, a cow will give us as beef only 10% of the protein and 4% of the calories it consumes. The rest is used by the cow to enable it to live and breathe throughout its lifetime. With 56 billion farm animals raised globally each year, you can see just how much food is being wasted. Wasting food by feeding it to farm animals fuels the global hunger crisis. With developing countries quickly changing from their traditional plant-centered diet to a western-style, meat-centered diet, it’s easy to see how hunger and malnutrition can spread. Many of these people live in countries which could feed themselves, but farmers, policy makers, and governments choose to feed crops to farm animals instead of people. The result is that they often need to import grain to feed their human population. This is expensive and drives up prices. A rising global population makes wasting food this way even more harmful. Raising meat is just plain crazy. Growing crops to feed farm animals not only replaces inexpensive nutritional protein with expensive nutrition, but also reduces the total amount available for human consumption because so much is wasted by the animal. While giving thanks for all that we have over the upcoming holidays, many of us like to remember all those in the world who do not have enough to eat. One organization which is working hard to promote a plant-based diet as a solution to global hunger is A Well-Fed World. We contacted Dawn Moncrief, the executive director, to learn more about what they’re doing. Tell us about A Well-Fed World. A Well-Fed World is a hunger relief and animal protection organization based in Washington, DC. We chip away at two of the world’s most immense, unnecessary and unconscionable forms of suffering… the suffering of people from lack of food and the suffering of animals used as food. We have a positive, practical and action-led approach that produces immediate assistance for those in need and structural change for lasting results. Most directly, we raise funds for, partner with, and promote innovative, highly-effective projects that strengthen: (1) vegan feeding & farming programs, (2) farm animal care & rescue, and (3) pro-veg advocacy & community-building. For the funding, our Sustainable Keys Global Grants program provides about 50 grants a year to projects in the U.S. and internationally. We also produce and disseminate research that demonstrates the negative consequences of using animals for food on issues of global hunger and global warming. We’re developing new materials on the harm caused by Heifer International and “humane” meat. I’m most excited about our Plants-4-Hunger campaign. It’s a direct alternative to Heifer International. It’s great for vegetarians/vegans to give AND receive. We choose four incredible vegan feeding programs and send 100% of all gift-donations to those groups. Details are at www.AWFW.org/gifts. Finally, we have a couple of fun grassroots campaigns. The PB&J Campaign encourages people to eat more peanut butter and less meat. The Worldwide Vegan Bake Sale raises more than $50,000 a year for a wide variety of vegan/animal organizations. What motivated you to get involved with A Well-Fed World? I was vegetarian since 19 because I cared about animals. I didn’t know the issues, just that eating animals hurt them, obviously enough. While I was in grad school for international relations, to work on global poverty issues, a friend introduced me to the concept of veganism. You can imagine that I wasn’t very happy to have my pizza and ice cream threatened, so I was definitely going to research the issues. As I did, it became very clear that, in addition to the unconscionable animal suffering, the consumption and production of animal-based foods has dire consequences for the environment and food security. Think tanks and policymakers would express concerns about the negative consequences of “livestock” on resource scarcity, pollution, land degradation and a host of other environmental problems (and now we have greenhouse gases too). But they wouldn’t advocate reducing meat consumption, even though it’s the most obvious and relatively easy way to reduce the pressure on the system. Instead they would say that the problem is “demand-driven” and we must therefore figure out the best way to meet that demand and minimize the inherent harm in the system. Their “solutions” of choice are to increase technology and slow population growth. There are pros and cons to those areas, but regardless reducing consumption is a must for any viable solution. It’s not enough on its own, but it must be part of the equation. So, that’s what I decided to focus on. I wrote my master’s thesis: “Rethinking Meat – Re-centering World Hunger Paradigms.” Since about 2000, I worked on the hunger-meat connections as a part-time, information campaign. I was fortunate to spend some time on it while working as program director, then executive director, at the Farm Animal Rights Movement (FARM). In 2009, I founded A Well-Fed World as a spin-off, to work on the issues full-time and to add a program component to the information aspect. Can you give us an overview of the size and scope of the global hunger problem? The complexity, longevity, and immensity of global hunger is staggering. The numbers are unimaginably high. 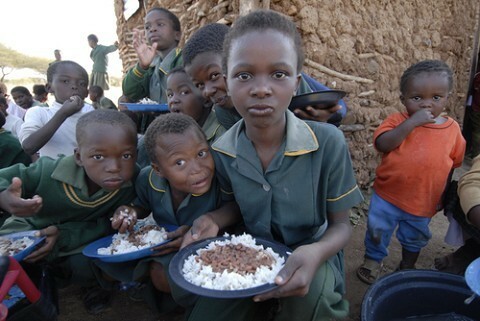 More than 24,000 people (mostly children) die EVERY day of hunger and hunger-related causes. That’s more than 1,000 EVERY hour. This is just the norm. You don’t hear about this on the news because it is not “new.” This is the accepted baseline. When you hear news, it’s because there is a crisis, like in 2008, that increases the numbers and causes civil unrest. Around 2000, when our population was around 5 billion, common numbers would be 1.2 billion people in extreme poverty, and other 1.2 billion in over-consuming “consumer” classes (the U.S., Europe, and other wealthy countries). The Worldwatch Institute had a publication about the “over-fed” and “under-fed.” It is actually the inspiration for a “well-fed” world. Numbers today are touted as a great improvement, ONLY 868 million. But these are deceptively undercounted. The methods of counting have changed and then some people (mostly in China) have crossed the international poverty line of $1.25/day. Some have significantly improved, but others are just barely over the line. Still others (especially in Sub-Sahara Africa) have seen an increase in poverty. The successes have been very regional. In regards to the $1.25 international poverty line, it’s not what a U.S. dollar could buy in a low-income country. As expected, the purchase power of the dollar is quite high in some areas. The poverty line is international, thus it is the equivalent of what $1.25 could buy in America. So, think about someone in America trying to pay for rent, utilities, medical care, and food on a $1.25/day. It’s impossible. Now factor in children. If the poverty line was increased to the absurdly low $2/day, about half the global population (more than 3 billion people) would fall under it. That’s about 10x the population of the U.S. (about 314 million). Remember, even with all the poverty in the U.S., we are still one of the wealthiest countries in the world and our population is relatively small. This makes it even more difficult for us to imagine the numbers. China has more than 1.3 billion, India more than 1.2 billion and the combined countries of Africa more than 1 billion. When the majority of their populations are impoverished, it’s a big deal globally. Please explain the advantages a plant-strong diet for alleviation of global hunger. In cold terms, animals are highly inefficient “converters” of food, energy, and natural resources. That is, animals consume much more food than they produce. For example, eating 1,000 calories of meat can easily use more than 7,000 calories of protein-packed plant-based foods, plus the immense amount of natural resources used. This matters because by using more than their “fair share,” animal-based foods are a form of overconsumption and redistribution that exacerbate food scarcity, especially in low-income countries. Live animals and animal-based foods are not only exported directly from low-income countries, vast amounts of staple foods are exported to be used as animal feed. To be clear, we’re not saying if Americans eat 10% less meat, that food will somehow appear to feed hungry people in poor countries. Hunger is extremely complex, but the connections are tangible. High demand for resource- and food-intensive meat, increases the prices of staple foods more generally. Food is literally bid away from the poor because wealthy populations can pay more for it to be used as animal feed. It’s obviously more complicated, but the basic supply-and-demand principles are sound. There are obvious differences in the amount of food consumed in low-, middle- and high-income countries. But the quantity in terms of “direct calories” consumed is far less important than the types of food when the “true caloric’ values are calculated. When staples foods are used as animal feed (so that 1,000 calories of meat equals 7,000 “true calories” of staples), the disparities are shockingly large. Eating less meat and other animal-based products, takes pressure off the economic food system. It reduces demand for food in general, which allows for lower prices, thus increasing availability for the poorest of the poor. It also sets a positive example and provides moral authority to seek reductions in other countries. Do you think that some of the global hunger organizations are starting to get the message? Are you optimistic for the future? I don’t think big changes in food policy will stem from hunger relief organizations. We are starting to make some inroads with environmental groups, because of the extreme impact that raising animals for food has on the natural resources and even more so because of climate change. With international institutions and think tanks, we see some positive movements, then fall backs. It’s very non-linear and it’s not clear that it’s an upward trend. As far as actual consumption, global meat consumption is skyrocketing. It’s on trend to double over 50 years. With the year 2000 as a starting point of 5 billion people and 50 billion animals killed for food globally, we’re now at 7 billion people and 70 billion animals. Predictions are that we will need 60-70% more food for 2050 and 9 billion people. On the upside, America is doing a little better. We decreased our consumption of animals from 10 billion a year to 9 billion. But we consume more meat per person than any other country, so there is much more we can do, and much more we need to do. If the U.S. public and policymakers were to make meat reduction a priority, it would have immense ripple effects globally. My prediction is that we will not hit the expected numbers of meat consumption in 2050. Unfortunately, that’s because of environmental limitations and climate disruptions, not proactive diet change. Add Microsoft founder and noted philanthropist, Bill Gates, to the list of leaders who understand that we can’t feed a growing and hungry population, in an environmentally sustainable way, on a meat-centered diet, especially when diet-related diseases now top the list worldwide. According to Bill Gates, “meat consumption worldwide has doubled in the last 20 years. By 2030, the world will need millions of tons more meat than it does today. 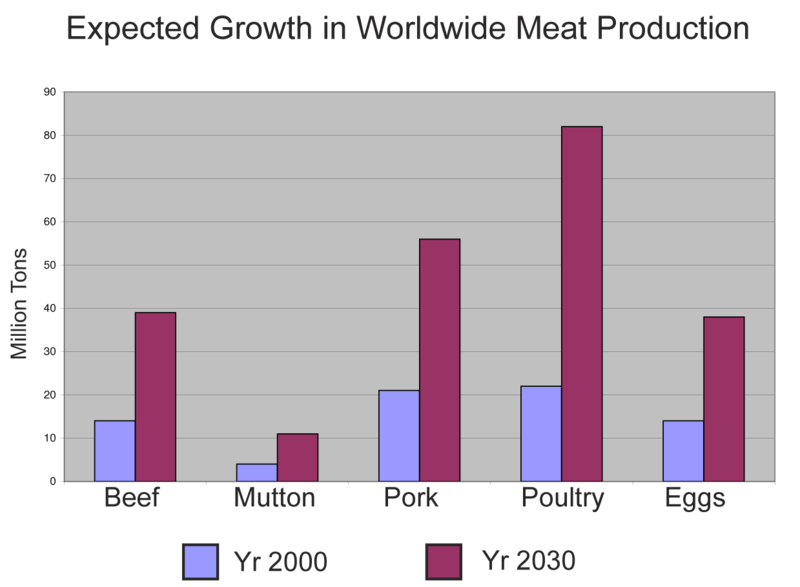 But raising meat takes a great deal of land and water and has a substantial environmental impact.” Gates cites the UN figures on the expected growth of meat (see chart). 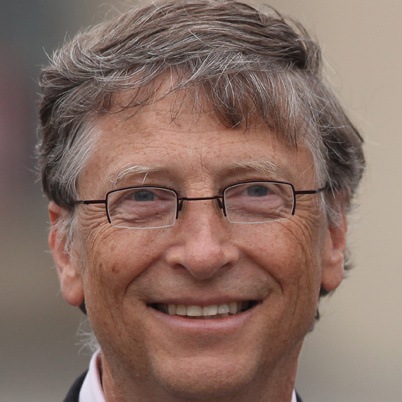 Gates’ foundation has also completed a major global study documenting various diseases. “Researchers released the results of a five-year project—funded by our foundation—to assess the prevalence of diseases, injuries and risk factors in 187 countries over a 20 year period—from 1990 to 2010. Known as the Global Burden of Disease 2010 (GBD), it is the most comprehensive study of its kind, and incorporates the work of hundreds of public health experts.” This study showed that along with the increase in global meat consumption comes an increase in diet-related diseases. For instance heart disease now tops the list of the most common diseases world-wide while stroke has moved to the number 3 position. Diabetes has also moved way up on the list. The message seems clear. Plant foods constitute the most sustainable and healthy future of food. To take part in this cutting edge trend, you need no special technology or billions of dollars. Healthy eating is as close as your kitchen and natural food store and Vegetarians of Washington is here to help! It’s official. The world’s population now stands at 7 Billion. Over a billion people are living with chronic hunger and malnutrition, and rising food prices are challenging the household budgets of the other 6 billion. What many people don’t know is that it is meat consumption in the developed world, and rapidly rising meat consumption in the developing world, that are the prime driving forces behind rising food prices and global hunger. For years this went unrecognized by even economists and policymakers. However, this has now started to change. Starvation kills, and it hurts to have to go to bed malnourished and hungry. Hunger and malnutrition are some of the most serious problems facing humanity and it’s getting worse. Global hunger is at an all time high, with about 1 billion people in the world going to bed each night still hungry. In the next year, over 10 million people will actually starve to death. Even worse, it is the children who are the most vulnerable. To understand how a vegetarian diet can help, let’s start with the agricultural facts of life. Farm animals function, in effect, as food factories in reverse; that is they give us less nutrition than they are fed. For instance, a cow will give us as beef only 10% of the protein and 4% of the calories it consumes. The rest is used by the cow to enable it to live and breathe throughout its lifetime. Here in the U.S., we feed 70% of the crops we grow to farm animals, who then return only a fraction of the nutrition as meat. It’s all so wasteful. Even a third of the fish caught worldwide are used to feed farm animals. With 56 billion farm animals raised globally each year, you can see just how much food is being wasted. Wasting food by feeding it to farm animals fuels the global hunger crisis. With developing countries quickly changing from their traditional plant-centered diet to a western-style, meat-centered diet, it’s easy to see how hunger and malnutrition can spread. Many of these people live in countries which could feed themselves, but farmers, policymakers, and governments choose to feed crops to farm animals instead of people, so most of the nutrition is wasted. The result is that they often need to import grain to feed their human population. This is expensive and drives up prices. A rising global population makes wasting food this way even more harmful. The recent shift of using some agricultural products, such as corn, to produce ethanol fuel for automobiles, makes switching to a vegetarian diet even more imperative. Now more than ever, the world’s hungry are counting on us to use available crops directly for food rather than wasting them by feeding them to farm animals. The drive to produce ever more food has had other consequences as well. Many people are surprised to learn that, except for here in the US, almost all of the suitable farm land is already being used. What’s left is land of marginal quality and using it results in greater amounts of pollution and ecological degradation. It has also led farmers in the developing world to embrace technology whose safety is still not proven, such as GMOs. For far too long, many would not face the role of raising meat in the global hunger crises. Fortunately, this is now beginning to change. For instance, Nobel Prize winning economist Muhammad Yunis (famous for his program of making microloans to poor people in the developing world) explains, “Unfortunately, meat eating is a relatively inefficient use of natural resources , as the number of nutritious calories delivered by meat is far lower than the calories humans can enjoy through the direct intake of grains. Yet today, more and more grain and other foodstuffs are being used to feed cattle than human beings. And more and more of the planet’s farmlands are being diverted from the production of food for human consumption toward to the growing of grains for animal feed, adding several costly steps to the process. As a result even basic foods are becoming more expensive.” And, no less than Chairman of the Federal Reserve, Ben Bernanke, says that “As they eat more beef and less grains and so on, the demand for food and energy rise and that’s the primary long-term factor affecting the real price of commodities and food.” A recent feature story in Foreign Policy magazine highlighted meat’s role in rising food prices, and a survey of economists reveal “increased demand for meat” as a leading cause of rising food prices and global hunger. Don’t get distracted from the agricultural facts of life. Natural catastrophes such as earthquakes and floods grab headlines and are a factor in food shortages. Warfare and political instability grab attention too, and can decrease the food supply. But it’s the day-in and day-out wasting of food, by feeding it to farm animals, that’s driving the massive global hunger and malnutrition problem. Sure food gets wasted and sure there’s poverty. But food has always been wasted, and there’s always been poverty, yet global hunger is getting worse. What’s changed is that meat consumption is sky rocketing in the developing world, which is using up crops that could be used for human consumption. With few exceptions, those countries with chronic hunger and malnutrition problems could feed themselves, if they would only stop taking their crops and feeding them to animals, and make them available for people instead. Yes, the world’s population is rising quickly, and that puts pressure on global food supplies, but a vegetarian diet could easily support a world population much larger than today’s. With a rising population, the only sustainable way out of the global hunger crisis is by reducing meat consumption and becoming vegetarians. More than just healthy and delicious, adopting a vegetarian diet of fruits, vegetables, grains, nuts and legumes is also an act of charity for those who need it the most. And, as is often the case with charity, those who give also receive. By adopting a vegetarian diet, we would not only potentially make more food available for the world’s hungry, but as nation we would also be taking the single most important step towards improving our own health, as well as the health of the planet. Now that’s a holiday dinner all of us can be truly grateful for.